After a hectic week with Organise My Home, we're back from Birmingham and the National Homebuilding & Renovating show. Now that we're back we wanted to help you find our more about what you saw at the show. We had a brand new stand that showcased our products even better and we think it helped you all imagine the possibilities that much better! But now that you're back how do you go about finding what you liked from our stand, here on our website? Well scroll down, and learn more about ClosetMaid and how you can turn your clients unused / unloved space into fully functional and maximised storage space! If you'd like to find out more about how to become a trade customer then click here: We're always looking for companies, home builders and dealers to work with, who are willing to offer ClosetMaid products alongside their own. We can offer design support to our trade clients and can arrange deliveries to individual customer addresses so that you don't need to carry stock unless you want to. Do you have a showroom? 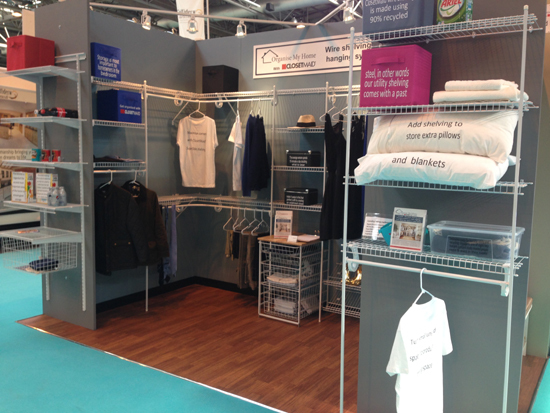 If you are able to dedicate display space to ClosetMaid in your showroom, speak to us about our showroom packages! 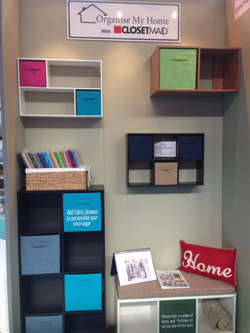 So now that you've seen the stand, what part of the home do your customers want to organise? Many of you were starting new builds or renovations which were going to include dressing rooms, or walk in closets. If you were one of these lucky people, you may want to find out a bit more about our walk in closet packages. Our wire shelving systems are perfect for walk in closets as they can be designed around you! Whether or not you choose one of our packages or opt for a custom design, all wire shelving can be trimmed down to suit your exact dimensions. Simply use a hacksaw or bolt-cutters to trim the shelving down as required. Take a look at our walk in closet packages here. Simply choose the design you like the best, and the size nearest to yours, and place your order. We'll ship your closet package with all the hardware and instructions you need! If you have a narrow closet area, where only two sides are useable, take a look at our L shape packages here. This will give you plenty of storage too, but still allow you enough space to manoeuvre in your room when finding that perfect outfit! Want to have a go at designing your own walk in closet? You'll find everything you need to create the perfect dressing room here! Select your shelving and hardware individually as required. Remember, you can trim shelving and hang bar down to suit the required length. Before you begin, take a look at this article we wrote to help you design a walk in wardrobe. It gives you basic information on how the system works and what you might need to consider when ordering hardware. If it's all too much to think about, or you have a slightly odd shaped room, or perhaps you just don't have the time to look through the website, click here to request a custom design! Even if you don't have the luxury of a walk in wardrobe / dressing room, ClosetMaid can still help get you organised and maximise the space that you do have. Whether you're removing the internal fittings of an existing built in wardrobe that needs re-organising or are creating a new one from scratch you can find shelving or a package to suit. 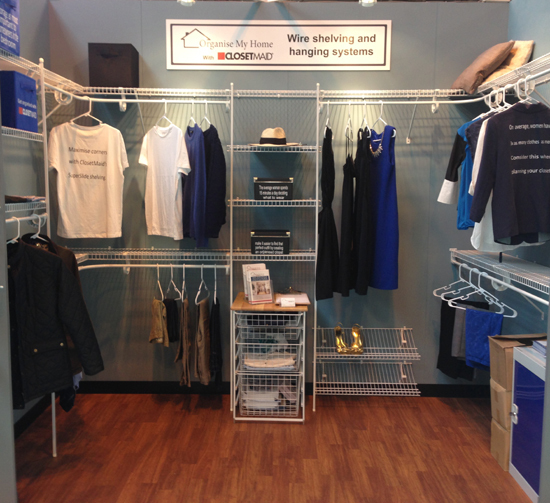 The designs shown on our stand used our SuperSlide shelving which is very popular, below we show you how to order a storage solution for your reach in closet using SuperSlide shelving. Click here to view our reach in closet packages that are available for adult or teen closets. Perhaps for the spare bedroom too! Select the design and size that best suits your requirements, and as before use bolt-cutters or a hacksaw to trim shelving down to fit your available space. Looking for something more specific? Request a custom design and have our design team maximise your space for you. Simply submit the dimensions of your space, make sure you include details of any obstacles such as sloping ceilings or windows etc. and we'll get back to you with a price and some plans to consider. Looking to DIY? Come up with your own design and order component parts, shelving and hardware individually to create your dream wardrobe! Click here to find all the necessary parts for a wardrobe storage system in one place. 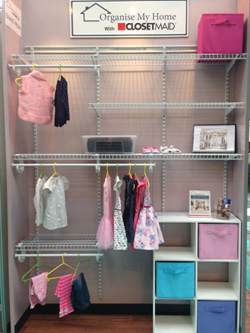 Our adjustable ShelfTrack range is the perfect partner for children's closets. ShelfTrack grows with your kids, so it's adjustable mounting system means that as your child grows, you can adapt the system to suit their growing needs. As their clothes get bigger, you can space the shelves and hanging sections to allow enough room, and as they grow from children to teens, you can swap their toy storage for their shoe storage! So if you're new project means that your home will become a home for life, and not just a temporary move, invest a little more in a clever system that will adapt as your family does! You can view our kids wardrobe packages here. Select the design and size nearest to your available space and trim to suit as required. Want to add shelving to a package or existing ClosetMaid system? Or perhaps you'd like to have a go at designing your own childs wardrobe to suit you and their clothes / toys? Take a look at our adjustable shelving section which shows you all of the hardware and shelving you might need to create your own wardrobe design. Want to get some advice? Request a custom design by clicking here. One of our team will get back to you with some plans and pricing for your available space. Remember to add the age of your child into the comments box as this will help us determine the size of their garments! For the first time, we had a whole section of our popular Cubeicals range at the exhibition and it sparked your interest in a big way! And how can we blame you? They look great, are well made, easy to assemble and with so many colour and size choices you're bound to find something for at least one room of the home! Take a look at our Cubeicals range here. You may have also found us on Amazon and seen our Cubeicals range there. It's exactly the same great product from ClosetMaid available from Organise My Home. Our hanging systems are also fantastic for creating storage in a laundry or utility room. Add shelving and hanging space and say goodbye to useless freestanding airers collapsing under the weight of your washing! Mount the ClosetMaid system directly onto your wall and use a design that's as complicated or simple as your needs are. Choose from one of our laundry or utility packages here to create the perfect storage space, click here to view the options. You can also take a look at our reach in wardrobe packages, using our slightly cheaper Shelf & Rod system which will give you plenty of shelving and hanging space perfect for a utility room or drying room, without the un-necessary added cost of the popular SuperSlide system. Click here to see the available options that you could consider for your laundry room. If you're looking for something really simple, why not create the design yourself. Take a look at our Shelf & Rod section which will show you all the shelving and hardware you might need to create your own useful utility space. Need some help? Why not request a custom design? Simply submit your dimensions and we'll do the rest for you! Our pantry and larder shelving systems are great for getting your food storage in order. Use our adjustable ShelfTrack fixing system to maintain flexibility. This way if you bulk buy large packets of dried foods or tins etc. you will have the ability to adjust the shelving height to suit. If you're on a budget, or know that your food storage space is unlikely to require changing around, select one of the fixed mount systems instead. Our adjustable ShelfTrack pantry systems are capable of holding between 20kg (stud walls) - 30kg (solid walls) of weight per linear 30cm of shelving, so for every 1.22m / 4' of shelving our ShelfTrack system will allow you to support up to 120kg! How many tins of beans can you fit on there? Take a look at the packages we offer for kitchen, pantry and larder storage here. If you can't find a package to suit, why not create your own system by ordering shelving and hardware separately, here. If you need someone to help and recommend a suitable layout, request a custom design by clicking here! Need more information? If something you saw at the show hasn't been covered here, or you are just looking for some more help or information, let us know. Call us on 01622 870050. Alternatively you can make an arrangement to visit our showroom in Tonbridge, Kent. Click here to fill out the appointment request and we'll make sure somebody is around to speak to you about your storage needs.